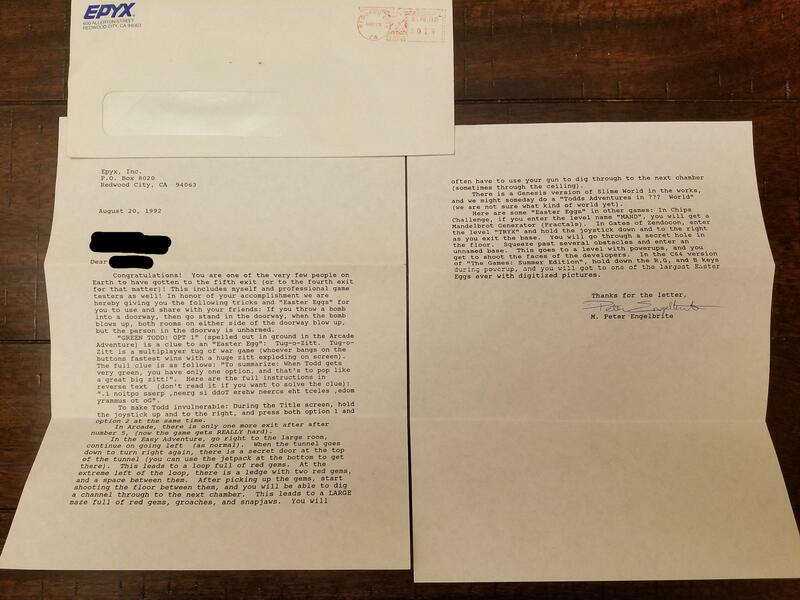 I wanted to share the letter I received in 1992 for Finishing Todd's Adventures in Slime World. If you found the real last exit in Arcade Mode, Todd gives you a message to write to Epyx, it says there is no reward, but I wrote to them, I don't remember what I wrote, but I ended up getting this signed letter from M. Peter Engelbrite. I thought this was a great reward. Edited by mmackin, Thu Feb 21, 2019 10:56 AM. That's one of the neatest Lynx-related things I've seen posted in years. This is great! When I was a kid, easter eggs and codes like this were the pinnacle of video gaming. Fantastic. I didn't know about the secret rooms in Area 1. And even now, over 25 years after I fell in love with this game, I've never had the patience to finish Area 6. Kudos to you for doing it. And thanks so much for posting this! Thank you for sharing this great piece of Lynx history! That is very cool. Were these secrets generally known back then, maybe in FAQs or strategy guides? Fantastic! Reminds me of sending analog photos of a high score to Activision for their 2600 games back in the 1980s.